A feature article about Adolphus Busch and his commandeering of the American brewing industry. (originally published in The American Mercury, October, 1929). Whatever odium may be attached to beer in other parts of the Republic, its status in St. Louis is as firmly grounded as James Eads' span across the Mississippi. Notwithstanding the desperate fight of the local Methodists to erase the blot from the city's history, the record stands. Beer made St. Louis, and Adolphus Busch made the beer. This king of brewers, curiously enough, was not really a brewer at all: he was a super-salesman, and perhaps the greatest ever heard of in America. Granted that he knew good beer and ever sought it, the fact remains that he did not know how to make it. In the course of time, to be sure, he found men who did, but that was a detail. He sold the bad almost as facilely as he sold the good. He could have sold anything. At one point in the early career of the Anheuser-Busch Brewery its product was so inferior that St. Louis rowdies were known to project mouthfuls of it back over the bar. But Adolphus kept on selling it, and presently it was better, and by and by, incarnated as Budweiser, Michelob and Faust, it was the best in America. Prior to 1850, because there were only a few German settlers, there was very little beer in St. Louis. Forty years earlier the first effort to introduce it had been made by a gentleman of French extraction, one M. St. Vrain, who is preserved for posterity for no other reason than that he scored the first of a long series of signal failures in that direction. M. St. Vrain was a citizen of Bellefontaine, a hamlet now a part of St. Louis. Finding his agricultural interests tedious, he sought a wider field of expression in the brewing industry, which had at that time attained some proportions in other parts of the United States. Ahead of his time, he launched an informative campaign in the form of a modest insertion in the town paper, to the effect that orders for table beer and porter directed to the St. Vrain Brewery would receive attention. His price for a barrel was ten dollars. It might as well have been fifty. The townsfolk were left cold and the venture died, and not long afterward M. St. Vrain expired. So on down through the years, with successors named English, Mullanphy, Lynch, and McHose acting their sad parts. The German conquest of St. Louis was as swift as it was complete. The citizenry had taken scant notice of the first few stragglers; a member of the town council quieted the first fears with the epigrammatic statement that "the German element in our town can be adequately served by one doctor and one midwife." That gentleman lived to see his words belied; a dozen years later he ate his prophecy when a leading newspaper called attention editorially to the profusion of beer-gardens and breweries. "They [the Germans]," said this paper, "maintain a constant babble as they sit around the tables in the open air, consuming the beer in unbelievable quantity. ...One can scarcely board an omnibus or purchase ordinary foodstuffs without some slight knowledge of their language." So breweries sprang up all over town and none suffered for lack of patronage. The first of any size was that of Adam Lemp, whose name is perpetuated in his descendants. He had time to become well established before the advent of Eberhard Anheuser. Eberhard tarried for two years in Cincinnati and when he did settle in St. Louis it was not to make beer but soap. He fared well enough in that undertaking to buy out the Bavarian Brewery. With that, the stage was set for the entrance of the principal actor in the great drama of beer. His arrival was inconspicuous, but he soon made his presence felt. Adolphus Busch came to St. Louis equipped with a sound training at the Gymnasium in Mainz. He was the youngest of twenty-one children begotten by Ulrick and Barbara Busch. He straightway got a job with a wholesale commission house, but his progress in that situation was interrupted by the outbreak of the Civil War. Surveying the issues briefly, he hopped in on the side of the Union, and, although his regiment was far removed from the main theatres of battle, he participated in random skirmishing with a General McNeil in Northern Missouri. There was nothing to interest an active lad in that mild sport, so her withdrew honorably after a brief service, to enter the brewers' supply business. That was something like. Among his customers was the Eberhard Anheuser aforesaid. 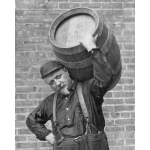 Eberhard, a brewer but no salesman, found difficulty in disposing of the beer his small equipment produced -- a mere 8,000 barrels annually -- and before long he found himself owing young Adolphus considerable money. The bill mounted and finally the supply agent was offered an interest in the brewery in lieu of payment. Adolphus grabbed the opportunity, for not long before he had cast an appreciative eye upon Anheuser's pretty daughter, Lily. Ulrich Busch, his brother, had meanwhile been paying attentions to Anna, the elder sister of Lily. The dual courtship was pursued with characteristic energy and dispatch. A year later a double wedding resulted and Adolphus joined his talents to those of his father-in-law. Here was man's work and he pitched into it with zest. By 1875 he had risen to the status of co-partner and the works were incorporated under the name of Anheuser-Busch. In 1880, old Eberhard went to his reward and Adolphus prepared for his really great achievements. His first objective was the local market; so far as he knew, indeed, it was to be the extent of his operations. Brewing was then distinctly a local industry. There was no bottled beer and the keg brew without the protection of refrigeration was sure to spoil if shipped to distant points. Consequently, the St. Louis trade was the plum, and it was a luscious one, for the natives, including those whose forbears had been hostile to the lures of drink, were already consuming millions of gallons a year. So there was money to be made and Adolphus set out to make it. He hadn't the best beer in town by several kegs full. William Lemp, son of old Adam, had a brew that was vastly superior. Adolphus knew it, and he worked feverishly to correct his own deficiency. But in his energetic search for a brewer and a formula, he never let his production be interrupted. If bad beer was all that he could produce, he must find a market for it. Competition was bitter but the profit was enormous. The sales strategy centered around the so-called beer collector, who bought and did not sell. All brewers had such spending agents, but Adolphus gathered a crew that was extraordinarily accomplished; he infused into its members his own masterly manner, and as a result his beer was soon selling almost as well as Lemp's. Every saloon that sold Busch beer was favored with a visit by the collector once each month, and in each he spent royally an amount proportionate to its monthly buy. The collector was thus an important personage. In Carondelet, the strictly German section, his social position was high, and even in Kerry Patch, altogether Celtic, he was greeted with profound respect. A gang of idlers followed his buggy all through the day. The collector made no complaint; so long as it was Busch beer that was being drunk, it made little difference who drank it. Taking drink for drink himself, he entered saloon after saloon, radiating a magnificent geniality and prefacing his ever-ready oration on any subject with a wave of a beer stein and, "Vell, I tell you." The collector had other duties beyond this mere buying of drinks. He was expected to attend all funerals in the families of saloon keepers, and to exhibit a decent grief. At the Irish wakes in the Patch, he wept with the most accomplished keeners. For that accomplishment he was known Carondelet as the Todsaufer -- the dead-drinker. In the midst of his most bitter sobs, however, he was kept under close watch by all the male mourners, for they knew that once the rites were over, there would be a gay time at the nearest bar of a Busch customer. The collector was also prominent at all weddings that had any bearing on the local market. He was ready with a gift for the happy couple, a story for the dinner, and a kiss for the bride. At Christmas he had a handsome gift for the saloon keeper's wife; its value was in proportion to the weekly sales. He extended his operations through the German lodges; he tumbled with the Turnvereine and roared and gurgled with the with the Gesangvereine. Obviously, he was in a position to wield a considerable influence in local politics. More often than not, in fact, he was the ward committeeman. One collector, concentrating his whole talents in this field, rose to be Police Commissioner. The majority, however, remained true to Busch and beer. That was the day of elegant art in the saloons. Every brewery issued a complimentary series of paintings, and those of Anheuser-Busch were of outstanding merit. One of the most inspiring was "Custer's Last Fight," in which scalped patriots and fierce Indians with poised knives were vividly portrayed. Altogether a noble work, it prompted many a bar-room oration. Another Busch opus was a brilliant poster depicting Adolphus himself and Bismarck. In it Adolphus was made to say, "I can assure Your Excellency that beer is the national drink of America." The dictator received the information with his usual stern look, albeit with evident satisfaction. There was perhaps more beer consumed in St. Louis while the breweries were running full blast than in any other city of its size in the world. Carondelet drank constantly, and Kerry Patch spent its evenings indulging the now lost art of rushing the can. With beer at five cents a glass, it was a luxury within the reach of everyone, however humble. The nickel, moreover, included a free lunch. At one point in the rivalry of the breweries beer was even cheaper than that. An English syndicate attempted to crowd in on the local market during the nineties. It succeeded in buying up most of the smaller works, but William Lemp and Adolphus Busch refused to sell. A beer war ensued. The price of a barrel dropped from $6 to $3. The saloon-keepers, instead of combining and pocketing the profit, cut the price to two glasses for five cents. Rock bottom was touched when one enterprising retailer offered two glasses of beer and a boat ride on the small lake adjoining his saloon, all for five cents. Lemp and Busch weathered the fight and the Englishmen retired in confusion.